The tropical art photos are made to give a special atmosphere in the room. Holiday colors and a landscape that makes you dream and brings you a warm side in a room with a good wall decoration design. 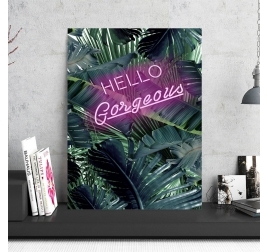 The tropical art photos on Artwall and Co are prime examples. A tropical art photo is always recognizable by its landscape that evokes the holidays, creating a clearly welcoming atmosphere. It is a good alternative to decorate with modernity aneutral wall or with dark color. 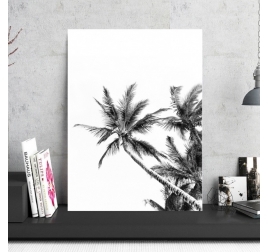 Whether for a bedroom, living room or dining room, there is always a tropical design photo that you can choose ! A soothing decor for this art design photo. This decorative frame is printed on aluminum for better quality. Several sizes available for this modern decoration. Worldwide shipping for this trendy frame. 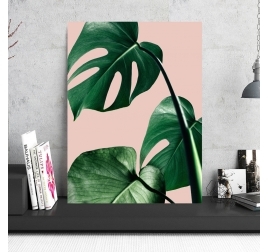 The leaves of monstera in a pink art ! 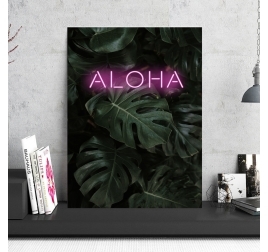 This frame is printed on aluminum foil for a unique quality. Several dimensions possible for this aluminum frame. Worldwide shipping for this alu frame. An elegant and trendy art photo for your home. This design frame has been printed on an aluminum support for better quality. Several dimensions are available for this decoration. Worldwide shipping for this modern wall decoration. Green banana leaves in a modern interior decoration. This nature photo is printed on aluminum for better quality. Several sizes available for this modern frame. Worldwide shipping for this decorative frame. This decorative frame presents a row of palm trees for a tropical touch. This frame is printed on an aluminum support for better quality. Several sizes available for this design decoration. Worldwide shipping for this decorative frame. A trendy frame that brings you a wind of freshness! This photo has been printed on aluminum for a unique quality. Several dimensions available for this design decoration. Worldwide shipping for this decorative frame. The famous fruit in a gold version in aluminum decoration ! This design frame is made on aluminum for a unique quality. Several dimensions are possible for this decorative frame. Worldwide shipping for this pineapple in gold decoration. The ultra trendy monstera leaf in black version! This art photo was printed on an aluminum support for a unique quality. Different sizes are available for this design frame. Worldwide shipping for this wall decoration. Known trees on exotic beaches in aluminum frame ! This art photo is available in several sizes for a unique composition. This black and white wall decoration is delivered with its hanging system. Worldwide shipping for this trendy frame.